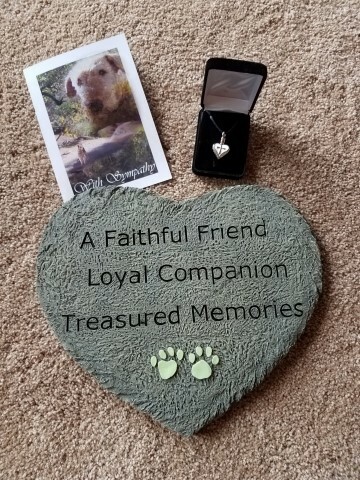 This set is perfect as a memorial gift to honor the memory of a beloved pet. It includes a heart-shaped stone crafted of durable, weatherproof cast resin. Two glow-in-the-dark paw prints highlight the loving sentiment "A Faithful Friend, Loyal Companion, Treasured Memories." Measures 12 inches at the widest point. The silver heart cremation pendant hangs from a 20" black satin cord with a silver clasp and features a cross on the front. The heart will hold a pinch of cremation remains. Also included is a pet sympathy card. This set can be gift wrapped free of charge and shipped to your loved one.